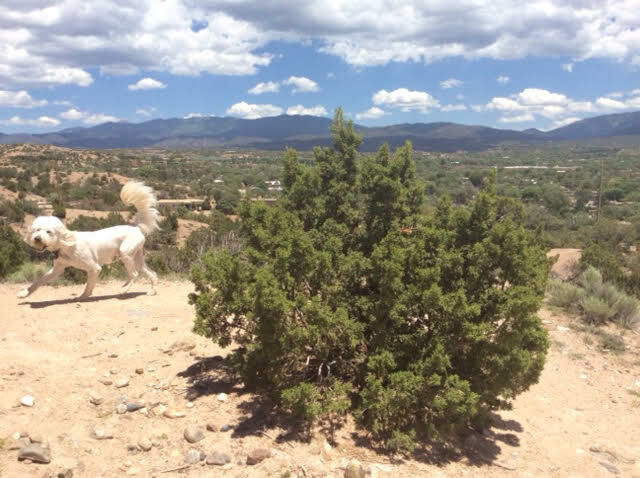 Having a yard to run around is wonderful, but when in Santa Fe you have access to some of the most beautiful walks and hikes in the Southwest. Grab your leash, some water, and help your human put on some good shoes; it’s time for adventure! Now, you and your owner don’t have to be super athletic to enjoy the outdoors and sunshine. The Borrega Trail offers a leisurely walk with lots of tree cover. 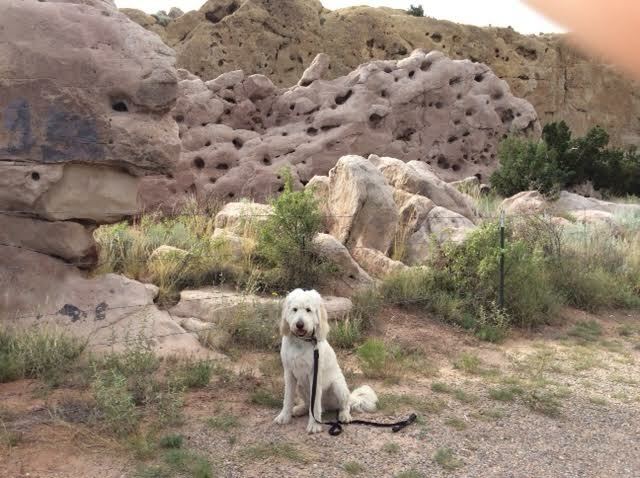 Your humans can even bring their pups on this trail, it’s kid-friendly! -Take a quick, right on Artist Rd. Monte Sol starts behind the library of St. John’s College and offers a very short hike. Wendy likes to take me here when we don’t have time for a full adventure, but still want to enjoy being outdoors. Another hike that can start in St. John’s College parking lot is up Atalaya Mountain. Wendy takes me here for a longer, leashed adventure. This is either a 4.6 mile or 7 mile hike depending on where we start. Starting at St. John’s adds approx. 45 minutes of extra on-paw time. Make sure your hiking buddy comes prepared and can comfortably carry water and snacks for you both. 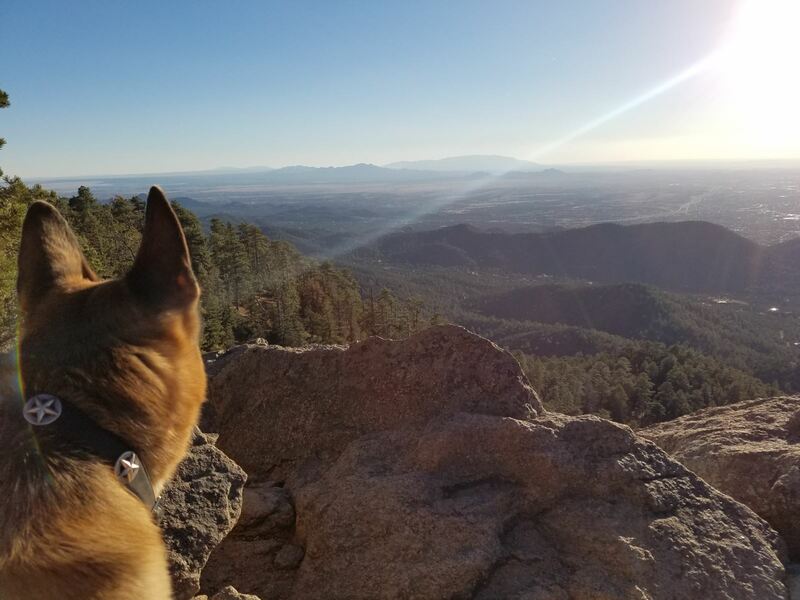 We recommend warmer weather for the Atalaya Trail as snow and ice can make it harder on both paws and shoes. There are signs about 1/3 of the way up that will guide you to harder or easier trails to continue. Wendy and I also like the Arroyo Chamiso Trail. Wendy says this trail connects with the Santa Fe Rail Trail and will take you all the way to the town of Eldorado. We are never that ambitious to hike all the way there, but the portion we do visit is always beautiful and gives me plenty of exercise for the day. Hyde Memorial State Park offers some of the best and prettiest hikes in the Santa Fe area. Wendy loves to come in fall, so she can see the leaves change color, which I guess is pretty for color-seeing folk; for me they just turn from dark grey to light grey, but if there are leaves on the ground I like to sniff them or roll around in the piles. Wendy doesn’t like this so much. I’ve heard that some of the trails don’t allow canine companions, but two of our favorite trails here do, and one has a waterfall! 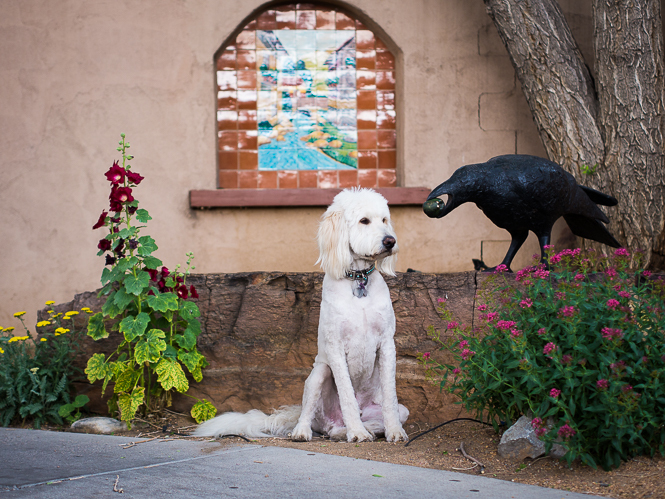 If you are more of a city dog who likes bumping into other pups while enjoying all the sights and smells of downtown, then a walk in one of Santa Fe’s neighborhoods is a must while visiting! 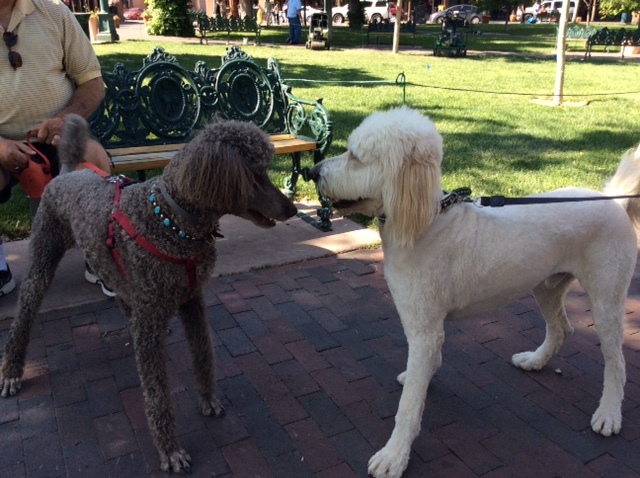 The Santa Fe Plaza is my favorite place to meet pups from other parts of the country and sometimes other parts of the world! 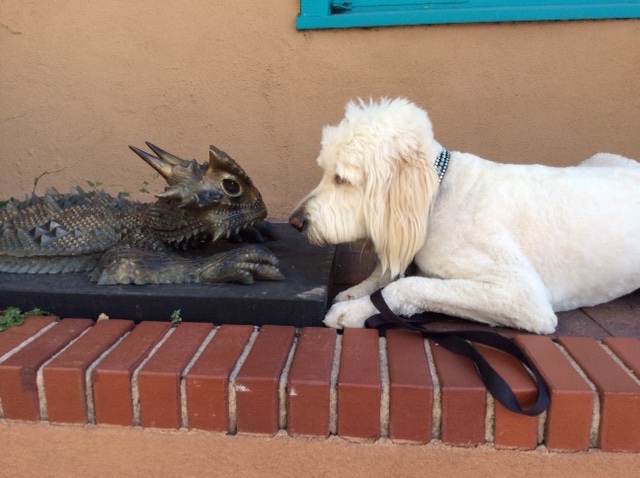 Here I am sniffing up to a new friend. I love seeing the square during the different times of year. In the Spring and Summer, it’s full of pretty flowers that make the air full of good smells. 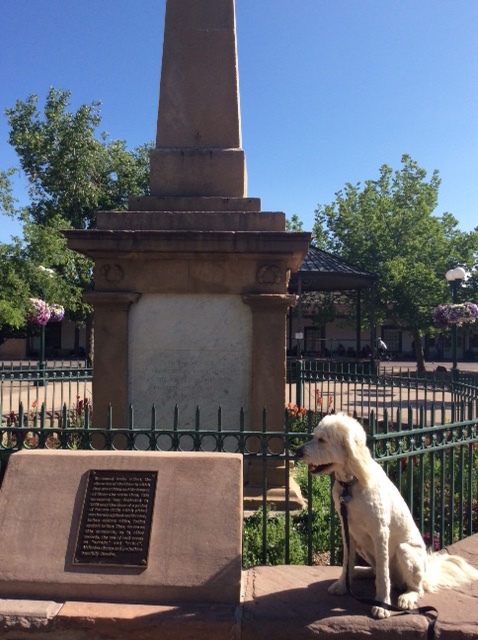 Wendy says during the Summer there are lots of festivals that take place in the Santa Fe Plaza, but I am not allowed to go. I guess it gets too crowded for canines. 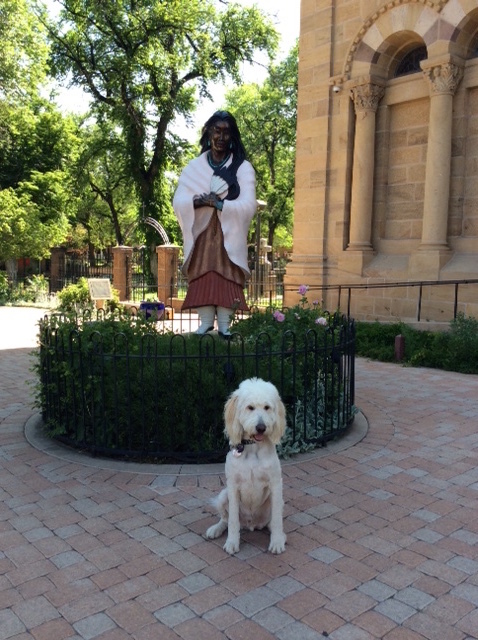 Just outside of the Santa Fe Plaza is the Cathedral Basilica of St. Francis of Assisi. 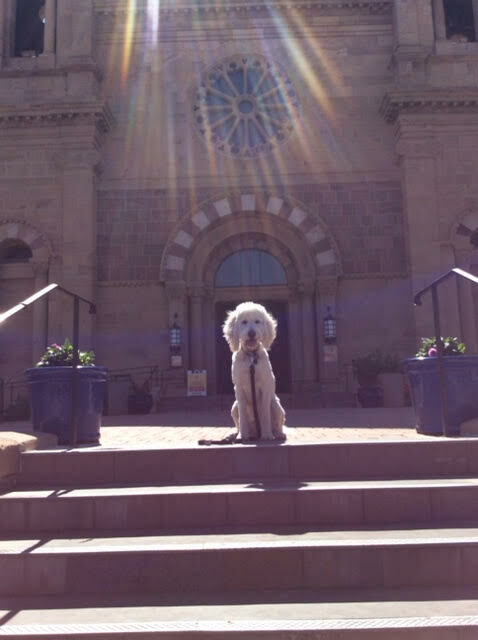 Wendy says it is one of Santa Fe’s most well known sites and that the inside has beautiful high ceilings and stained glass windows with lots of vibrant colors. I can tell by the outside it’s worth a visit, so here I am waiting on the steps since I’m not aloud inside. Also, near the Santa Fe Plaza is the New Mexico Museum of Art. This is unfortunately another place we bubs aren’t allowed, but I know how much Wendy enjoys it, so I don’t mind waiting outside. 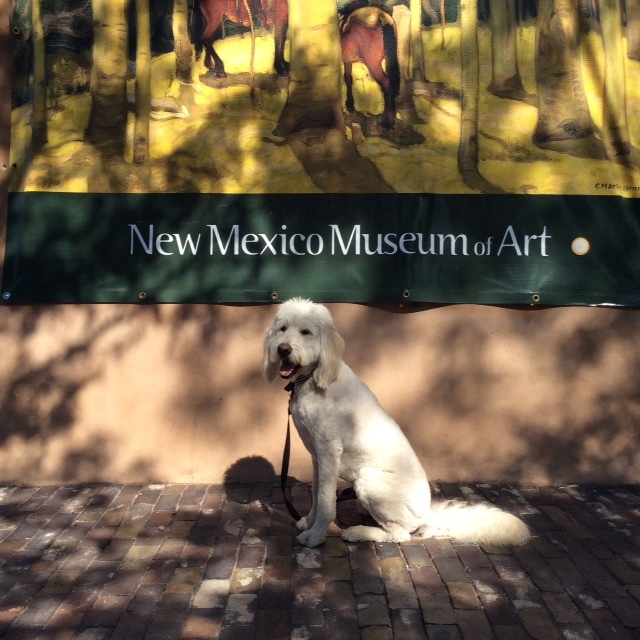 Wendy says the New Mexico Museum of Art is the oldest art museum in the state and features over 20,000 pieces. I wonder if any of them are of dogs?!? 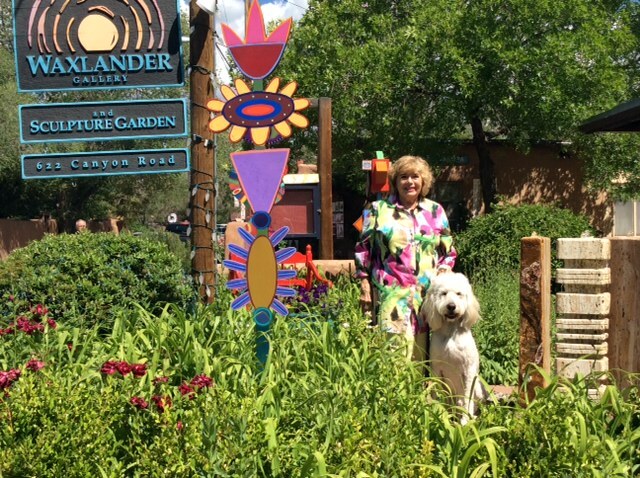 If your owner enjoys exhibits and museums like Wendy does, they should check out Santa Fe’s Museum Hill located off the Old Santa Fe Trail. 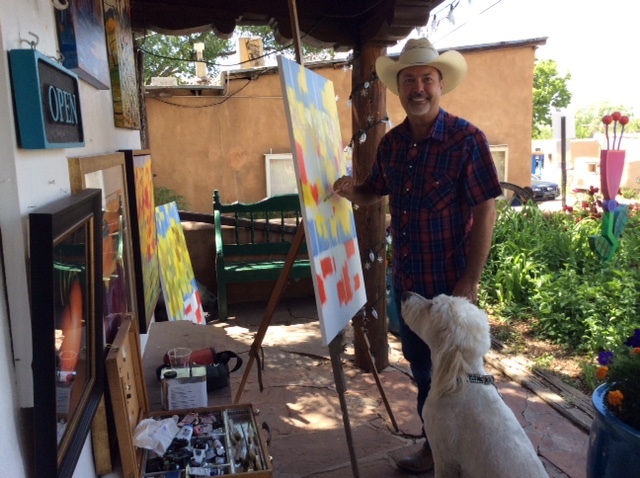 Like the New Mexico Museum of Art, we doggies aren’t allowed inside, so this would be a great opportunity to nap on the patio at your Two Casitas rental while your family visits the 4 museums at this location. Museum Hill consists of The Museum of Indian Arts & Culture, the Wheelwright Museum of the American Indian, the Museum of Spanish Colonial Art, and the Museum of International Folk Art. 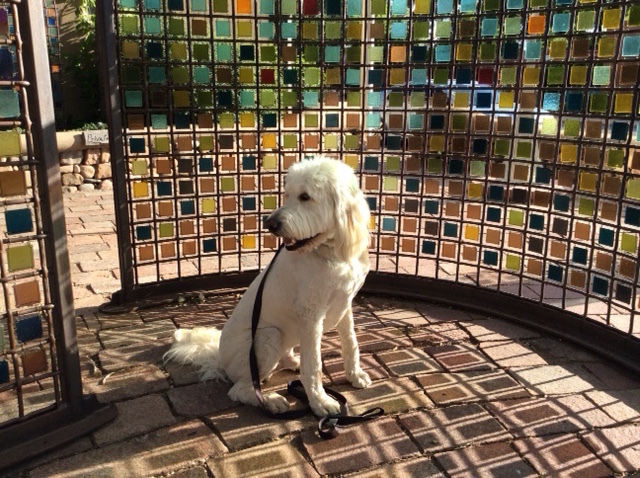 Wendy says the Museum Hill Café is really yummy, and even though the museum’s aren’t pet friendly, the patio at this cafe is! Santa Fe’s Canyon Road is a mile long stretch of galleries and restaurants. This area has amazing restaurants and patios I can hang out at, but I will get into that more in the restaurant guide. Surprising to some dog owners, almost all the galleries in this area allow me to go in. They understand us dogs have a high sense of aesthetic. They also understand this can be a very long walk since there is much to look at; so some galleries will put water out that I can drink then give me a treat when I’m a good boy. At the bottom of Canyon Road is one of my favorite parks in Santa Fe. Patrick Smith Park is where Wendy lets me run around as a free man! She can get in trouble for this, I’m supposed to keep my leash on, but it’s definitely nice to have one last hoorah before I get back in the car. Wendy tells me this area has recently gone through a “renaissance.” That’s a fancy word for this area has been updated. It used to be a very authentic, local neighborhood, but has since gotten gentrified. Now it is known as the new “So-Ho” of Santa Fe. From the Rail Yard there are walks where you can go for miles and miles if your owner is up for a big trek. 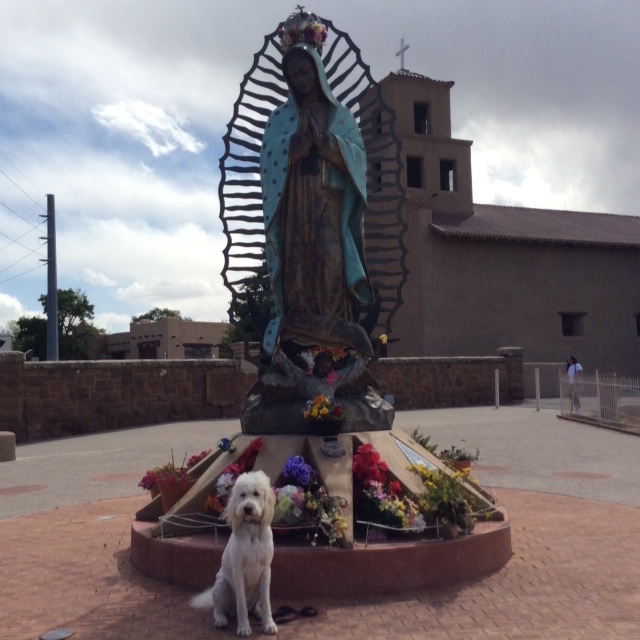 While in the Rail yard, I like to walk past the Lady of Guadalupe statue that’s in front of the Lady of Guadalupe Church. Wendy said she came all the way from Chihuahua, Mexico which would be a very very very long adventure on paw; so I always take a moment to appreciate how far she came to be here. 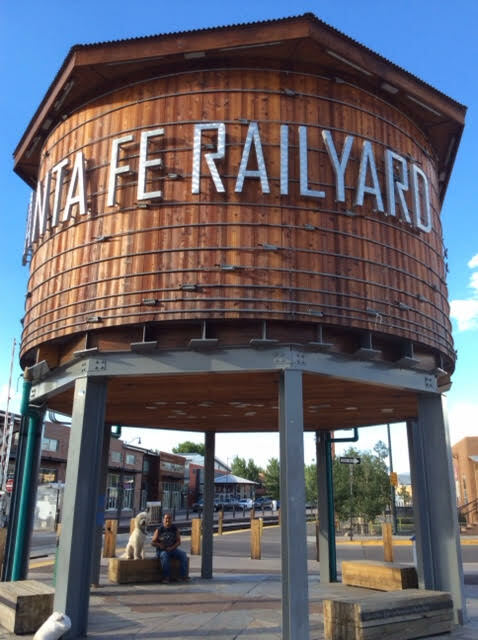 Santa Fe’s Farmer’s Market is also in this area. Wendy comes home from there with lots of vegetables, YUCK! Maybe I’m just bitter because I’m not allowed to go. They think we dogs will want to steal tomatoes or something.... (eye roll). 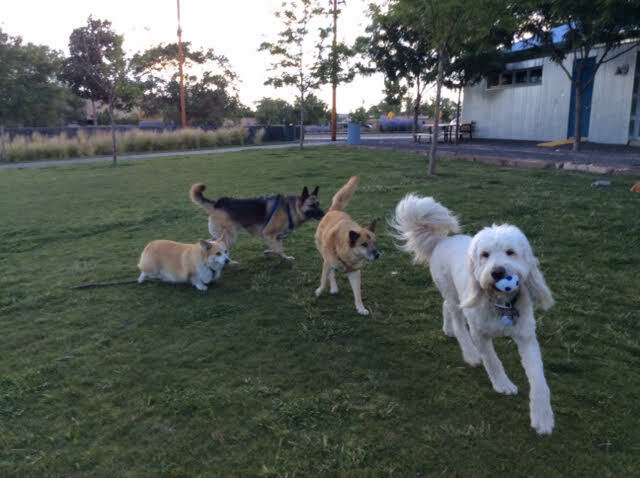 This area has a big park too, Santa Fe Rail Yard Park, where I see other dogs running free. I’m not sure if they are suppose to be free or be on leash, but they always look like they are having fun. Wendy and I like to sit at the shady, picnic areas when the sun gets too hot. They also have clean water available for drinking and filling up bottles.This park is great for human pups too. There is a place for kids to play where they can climb, slide and have some fun. Makes me laugh how dog-like they are when in groups. In the downtown area there is a walking route Wendy and I like to take that runs next to the Santa Fe River. You can walk this path all the way from St. Francis to Upper Canyon. Most of the time the water isn’t very deep, not enough to splash in, but because of the water source this walk offers a lot of shade trees and green foliage. There are also a picnic tables where we can take a rest. and some days this is just enough exercise. Running free, feeling the wind in my fur and ears is one of my most favorite things to do. 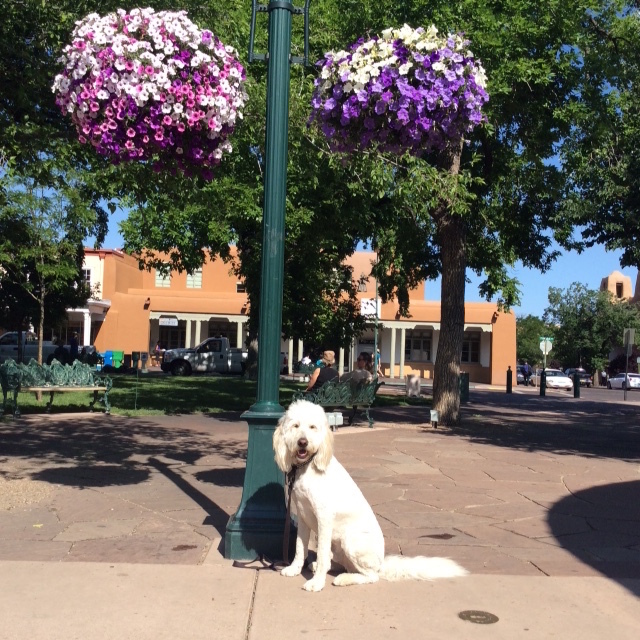 Luckily, I live in Tesuque Village where there are no leash laws, so I can roam as I feel. 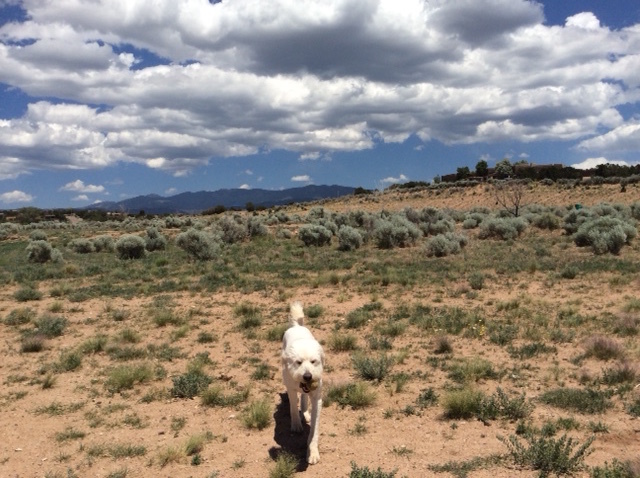 For the other pups in Santa Fe or those traveling to Santa Fe, the best place to run around is one of the off-leash dog parks. 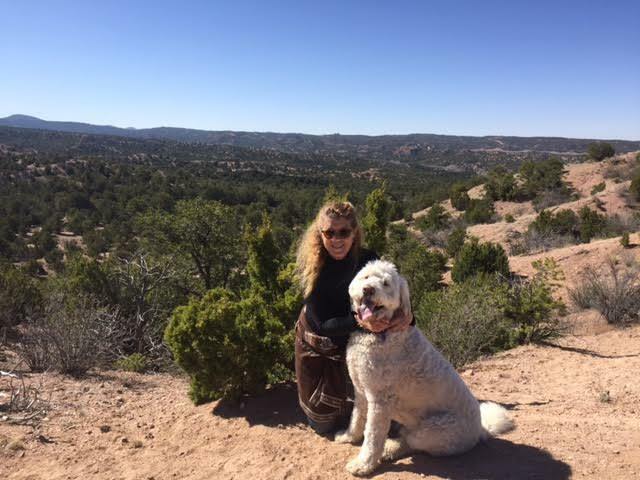 Frank S. Ortiz Dog Park is very close to the downtown/Plaza area, making it convenient for your owner, and is one of my favorite places to “loosen my collar.” With miles of off-leash trails and open space under a big, blue, Santa Fe sky this is a dog’s utopia! Also, available at the park are doggie clean up bags and water; you know, the necessities that our owners sometimes forget or run out of. After running around so much I know I tend to guzzle my water up! An important note is this park is not gated or fenced, so responding to your owners voice is a must! If you are still in training, have your family bring a leash just in case. 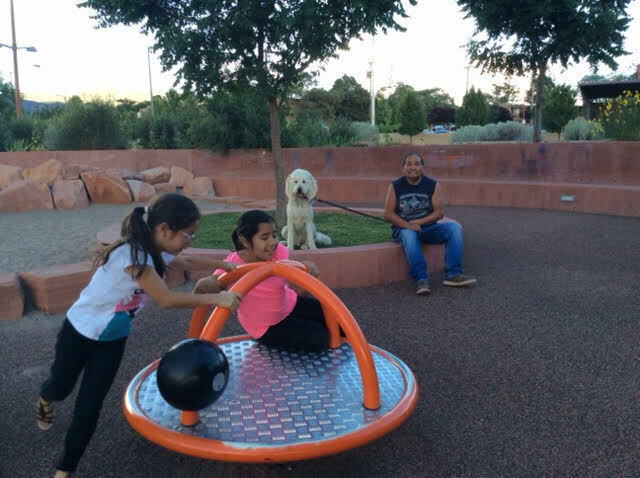 This dog park, which is actually a campus of five parks, is located approximately 20 minutes from the Santa Fe Plaza and totally worth the drive! Wendy said the larger park is 7-acres. 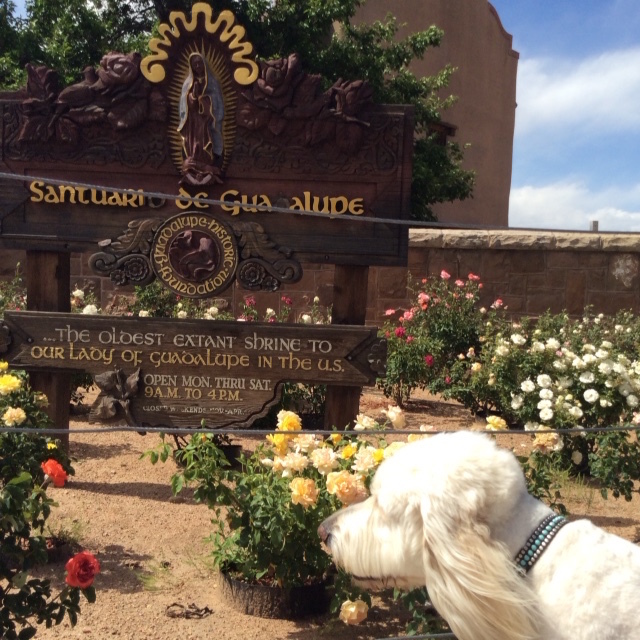 7 ACRES open to Santa Fe’s dog community to run, play and socialize pooch to pooch in an enclosed, fully fenced area. There is a separate park for smaller dogs like my friend Fawn, called Samantha’s Park of Small Dogs. This is perfect for dogs under 30 pounds to frolic without having to worry about us tall, clumsy guys tripping over them causing a dog pile. Also, there are 3 other large dog parks designated for individual use. Wendy says this space has to be shared and we pups have to take turns exercising every 30 minutes. I guess some would call that interval training (hee hee)!?! So if you are socially awkward or still working on your training, these 3 enclosed spaces are meant for you to get your wiggles out.